Home Tags Posts tagged with "collapsed building"
At least three people have been killed and dozens more are trapped in the centre of the main Tanzanian city, Dar es Salaam, after a multi-storey building collapsed, rescue workers say. Thirteen people have been pulled out of the ruins alive, officials say. Some 45 people, including construction workers, residents and children from a Koranic school, are missing. The 12-floor building under construction is now a “huge pile of chaos”. “I thought there was an earthquake and then I heard screaming. 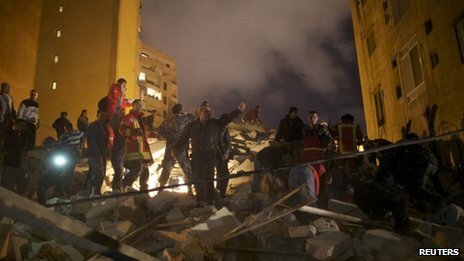 The whole building fell on itself,” eyewitness Musa Mohamed told the AFP news agency. Ahuge crane is pulling out a mass of iron bars to get access to the centre of the building, where some people are thought to be still alive. Trapped victims are said to have been making phone calls to friends and relatives. Bulldozers are also being used to move the rubble. 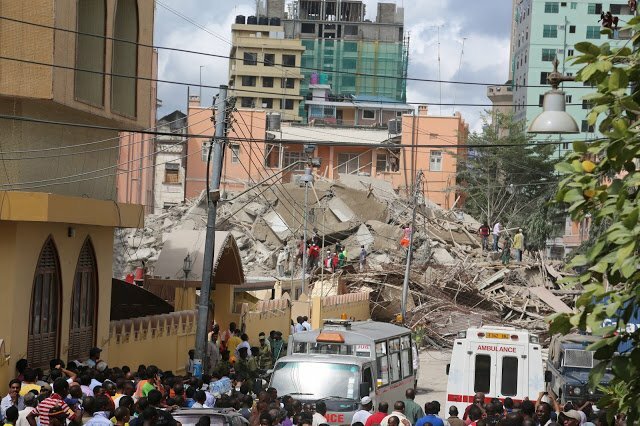 The collapsed building was near a mosque, as well as other residential and commercial properties in central Dar es Salaam.